This image is from the last sequence of images NASA's Dawn spacecraft obtained of the giant asteroid Vesta, looking down at Vesta's north pole as it was departing. When Dawn arrived in July 2011, Vesta's northern region was in darkness. The shadowy outlines of the terrain in Vesta's northern region are visible in this image from NASA's Dawn spacecraft. A web video celebrating Dawn's "greatest hits" at Vesta is available at http://www.nasa.gov/multimedia/video...a_id=151669301. Two of Dawn's last looks at Vesta are also now available, revealing the creeping dawn over the north pole. PASADENA, Calif. - NASA's Dawn mission is releasing two parting views of the giant asteroid Vesta, using images that were among the last taken by the spacecraft as it departed its companion for the last year. 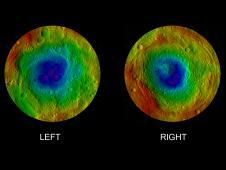 The first set of images is a color-coded relief map of Vesta's northern hemisphere, from the pole to the equator. It incorporates images taken just as Dawn began to creep over the high northern latitudes, which were dark when Dawn arrived in July 2011. 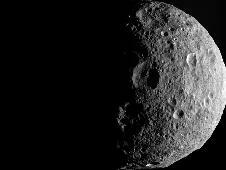 The other image is a black-and-white mosaic that shows a full view of the giant asteroid, created by synthesizing some of Dawn's best images. As NASA's Dawn spacecraft takes off for its next destination, this mosaic synthesizes some of the best views the spacecraft had of the giant asteroid Vesta. This image from NASA's Dawn mission shows the topography of the northern and southern hemispheres of the giant asteroid Vesta, updated with pictures obtained during Dawn's last look back. "Dawn has peeled back the veil on some of the mysteries surrounding Vesta, but we're still working hard on more analysis," said Christopher Russell, Dawn's principal investigator at UCLA. "So while Vesta is now out of sight, it will not be out of mind." These will be the last daily images during the cruise to Dawn's second destination, the dwarf planet Ceres. Other images will be highlighted as findings are made. Other data will be archived at http://pds.nasa.gov. Dawn left Vesta on Sept. 4, 2012 PDT (Sept. 5, 2012 EDT). The spacecraft is using its ion propulsion system to travel to Ceres. It is expected to arrive in early 2015. PASADENA, Calif. - NASA's Dawn spacecraft has revealed that the giant asteroid Vesta has its own version of ring around the collar. Two new papers based on observations from the low-altitude mapping orbit of the Dawn mission show that volatile, or easily evaporated materials, have colored Vesta's surface in a broad swath around its equator. Pothole-like features mark some of the asteroid's surface where the volatiles, likely water, released from hydrated minerals boiled off. 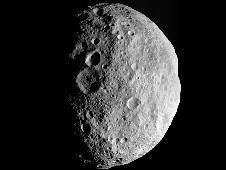 While Dawn did not find actual water ice at Vesta, there are signs of hydrated minerals delivered by meteorites and dust evident in the giant asteroid's chemistry and geology. The findings appear today in the journal Science. One paper, led by Thomas Prettyman, the lead scientist for Dawn's gamma ray and neutron detector (GRaND) at the Planetary Science Institute in Tucson, Ariz., describes how the instrument found signatures of hydrogen, likely in the form of hydroxyl or water bound to minerals in Vesta's surface. "The source of the hydrogen within Vesta's surface appears to be hydrated minerals delivered by carbon-rich space rocks that collided with Vesta at speeds slow enough to preserve their volatile content," said Prettyman. A complementary paper, led by Brett Denevi, a Dawn participating scientist based at the Johns Hopkins University Applied Physics Laboratory in Laurel, Md., describes the presence of pitted terrain created by the release of the volatiles. This perspective view of Marcia crater on the giant asteroid Vesta shows the most spectacularly preserved example of "pitted terrain," an unexpected discovery in data returned by NASA's Dawn mission. This map from NASA's Dawn mission shows the global distribution of hydrogen on the surface of the giant asteroid Vesta. Hydrogen is most abundant in areas with low reflectivity, or albedo, on the giant asteroid Vesta, as shown in this contour map from NASA's Dawn mission. This perspective view of Cornelia crater on the giant asteroid Vesta shows an example of "pitted terrain," an unexpected discovery in data returned by NASA's Dawn mission. These enhanced-color views from NASA's Dawn mission show an unusual "pitted terrain" on the floors of the craters named Marcia (left) and Cornelia (right) on the giant asteroid Vesta. A distinctive "pitted terrain" observed by NASA's Dawn mission on Vesta has also been seen on Mars. Vesta is the second most massive member of the main asteroid belt. The orbit at which these data were obtained averaged about 130 miles (210 kilometers) above the surface. Dawn left Vesta earlier this month, on Sept. 4 PDT (Sept. 5 EDT), and is now on its way to its second target, the dwarf planet Ceres. Scientists thought it might be possible for water ice to survive near the surface around the giant asteroid's poles. Unlike Earth's moon, however, Vesta has no permanently shadowed polar regions where ice might survive. The strongest signature for hydrogen in the latest data came from regions near the equator, where water ice is not stable. In some cases, other space rocks crashed into these deposits later at high speed. The heat from the collisions converted the hydrogen bound to the minerals into water, which evaporated. The holes that were left as the water escaped stretch as much as 0.6 miles (1 kilometer) across and go down as deep as 700 feet (200 meters). Seen in images from Dawn's framing camera, this pitted terrain is best preserved in sections of Marcia crater. "The pits look just like features seen on Mars, but while water was common on Mars, it was totally unexpected on Vesta in these high abundances," said Denevi. "These results provide evidence that not only were hydrated materials present, but they played an important role in shaping the asteroid's geology and the surface we see today." GRaND's data are the first direct measurements describing the elemental composition of Vesta's surface. Dawn's elemental investigation by the instrument determined the ratios of iron to oxygen and iron to silicon in the surface materials. The new findings solidly confirm the connection between Vesta and a class of meteorites found on Earth called the Howardite, Eucrite and Diogenite meteorites, which have the same ratios for these elements. In addition, more volatile-rich fragments of other objects have been identified in these meteorites, which supports the idea that the volatile-rich material was deposited on Vesta. The mechanism that incorporates water into the terrestrial planets is a matter of extensive debate for planetary scientists. Now, observations of the giant asteroid Vesta by NASA's Dawn mission suggest that hydrated materials were delivered to it mainly through a buildup of small particles during an epoch when the solar system was rich in dust. This is a radically different process from the way hydrated materials have been deposited on the moon and may have implications for the formation of terrestrial planets, including the delivery of the water that formed Earth's ocean. Maria Cristina De Sanctis and the Dawn team present the scenarios today at the European Planetary Science Congress in Madrid, Spain. "Vesta's surface shows distinct areas enriched with hydrated materials," said De Sanctis, of the Italian National Institute for Astrophysics in Rome. "These regions are not dependent on solar illumination or temperature, as we find in the case of the moon. The uneven distribution is unexpected and indicates ancient processes that differ from those believed to be responsible for delivering water to other airless bodies, like the moon." This map from NASA's Dawn mission indicates the presence of hydrated minerals on the giant asteroid Vesta. Hydrated minerals are seen in white, with areas of high concentrations circled with a yellow dotted line in the annotated version. The data were obtained by Dawn's visible and infrared mapping spectrometer in August 2011, from an altitude of 1,700 miles (2,700 kilometers). A team led by De Sanctis studied data from Dawn's visible and infrared mapping spectrometer, which complement recently reported data on hydrogen distribution from Dawn's gamma ray and neutron detector. Their analysis showed large regional concentrations of hydroxyl - a hydrogen and an oxygen atom bound together - clearly associated with geological features, including ancient, highly-cratered terrains and a crater named Oppia. Hydroxyl on the surface of the moon is thought to be created continuously by the interaction of protons from the solar wind with the top 10 feet (few meters) of the lunar surface, or regolith. Highest concentrations are found in areas near the lunar poles and in permanently shadowed craters where it is very cold. By contrast, the distribution of hydroxyl on Vesta is not dependent on significant shadowing or unusual cold temperatures. It is also stable over time, so its origin does not appear to be due to short-term processes. The hydroxyl-rich regions on Vesta broadly correspond to its oldest surfaces. Around relatively large and young impact craters, hydroxyl detections are weak or absent, suggesting that the delivery of the substance is not an ongoing process. The evidence from Dawn's visible and infrared mapping spectrometer suggests that much of Vesta's hydroxyl was delivered by small particles of primitive material, less than a few centimeters in diameter, over a time-limited period. This period may have occurred during the primordial solar system, around the time water is believed to have accumulated on Earth, or during the Late Heavy Bombardment, when collisions with space rocks would have produced a significant amount of dust. However, this is not the whole story of hydrated materials on Vesta. The Oppia Crater is hydroxyl-rich, but not covered with the primitive dark material. This suggests there is more than one mechanism at work for depositing hydroxyl on Vesta's surface. "The origin of Vesta's hydroxyl is certainly complex and possibly not unique: there could be various sources, like formation of hydroxyl actually on Vesta, in addition to the primordial impactors," said De Sanctis. "Vesta is providing new insights into the delivery of hydrous materials in the main asteroid belt, and may offer new scenarios on the delivery of hydrous minerals in the inner solar system, suggesting processes that may have played a role in the formation of terrestrial planets." Enormous troughs that wrap around the giant asteroid Vesta may actually be dropped blocks of terrain bounded by fault lines, suggesting a geologic complexity beyond that of most asteroids. Since the discovery of the troughs last year in data from NASA's Dawn spacecraft, scientists have been working to determine the story behind these unusual features. The research reinforces the claim that Vesta has a core, mantle and crust, a structure normally reserved for larger bodies, such as planets and large moons. This full view of the giant asteroid Vesta was taken by NASA's Dawn spacecraft, as part of a rotation characterization sequence on July 24, 2011, at a distance of 3,200 miles (5,200 kilometers). A rotation characterization sequence helps the scientists and engineers by giving an initial overview of the character of the surface as Vesta rotated underneath the spacecraft. An extensive system of troughs encircles Vesta's equatorial region. The biggest of those troughs, named Divalia Fossa, surpasses the size of the Grand Canyon. It spans 289 miles (465 kilometers) in length, 13.6 miles (22 kilometers) in width and 3 miles (5 kilometers) in depth. The complexity of the troughs' morphology can't be explained by small collisions. New measurements from Dawn indicate that a large collision could have created the asteroid's troughs, said Debra Buczkowski, a Dawn participating scientist based at the Johns Hopkins University Applied Physics Laboratory in Laurel, Md., who is the lead author of a new paper in Geophysical Research Letters, a journal of the American Geophysical Union. The crustal layer at the surface appeared to stretch to the breaking point and large portions of the crust dropped down along two faults on either side of the downward-moving block, leaving the giant troughs we see today. The scale of the fracturing would only have been possible if the asteroid is differentiated - meaning that it has a core, mantle and crust. "By saying it's differentiated," said Buczkowski, "we're basically saying Vesta was a little planet trying to happen." For more information on the paper, see http://www.agu.org/news/press/pr_arc.../2012-42.shtml. Like a Hollywood starlet constantly retouching her makeup, the giant asteroid Vesta is constantly stirring its outermost layer to present a young face. 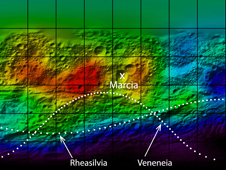 Data from NASA's Dawn mission show that a form of weathering that occurs on the moon and other airless bodies we've visited in the inner solar system does not alter Vesta's outermost layer in the same way. Carbon-rich asteroids have also been splattering dark material on Vesta's surface over a long span of the body's history. The results are described in two papers released today in the journal Nature. "Dawn's data allow us to decipher how Vesta records fundamental processes that have also affected Earth and other solar system bodies," said Carol Raymond, Dawn deputy principal investigator at NASA's Jet Propulsion Laboratory, Pasadena, Calif. "No object in our solar system is an island. Throughout solar system history, materials have exchanged and interacted." Over time, soils on Earth's moon and asteroids such as Itokawa have undergone extensive weathering in the space environment. Scientists see this in the accumulation of tiny metallic particles containing iron, which dulls the fluffy outer layer. Dawn's visible and infrared mapping spectrometer (VIR) and framing camera detected no accumulation of such tiny particles on Vesta, and this particular protoplanet, or almost-planet, remains bright and pristine. This image from NASA's Dawn spacecraft shows a close up of part of the rim around the crater Canuleia on the giant asteroid Vesta. Canuleia, about 6 miles (10 kilometers) in diameter, is the large crater at the bottom-left of this image. This image from NASA's Dawn spacecraft features the distinctive crater Canuleia on the giant asteroid Vesta. Canuleia, about 6 miles (10 kilometers) in diameter, is distinguished by the rays of bright material that streak out from it. Nevertheless, the bright rays of the youngest features on Vesta are seen to degrade rapidly and disappear into background soil. Scientists know frequent, small impacts continually mix the fluffy outer layer of broken debris. Vesta also has unusually steep topography relative to other large bodies in the inner solar system, which leads to landslides that further mix surface material. "Getting up close and familiar with Vesta has reset our thinking about the character of the uppermost soils of airless bodies," said Carle Pieters, one of the lead authors and a Dawn team member based at Brown University, Providence, R.I. "Vesta 'dirt' is very clean, well mixed and highly mobile." 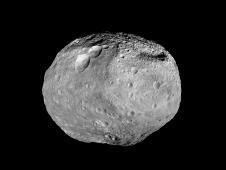 Early pictures of Vesta showed a variety of dramatic light and dark splotches on Vesta's surface. These light and dark materials were unexpected and now show the brightness range of Vesta is among the largest observed on rocky bodies in our solar system. Dawn scientists suspected early on that bright material is native to Vesta. One of their first hypotheses for the dark material suggested it might come from the shock of high-speed impacts melting and darkening the underlying rocks or from recent volcanic activity. An analysis of data from VIR and the framing camera has revealed, however, that the distribution of dark material is widespread and occurs both in small spots and in diffuse deposits, without correlation to any particular underlying geology. The likely source of the dark material is now shown to be the carbon-rich material in meteoroids, which are also believed to have deposited hydrated minerals from other asteroids on Vesta. To get the amount of darkening we now see on Vesta, scientists on the Dawn team estimate about 300 dark asteroids with diameters between 0.6 to 6 miles (1 and 10 kilometers) likely hit Vesta during the last 3.5 billion years. This would have been enough to wrap Vesta in a blanket of mixed material about 3 to 7 feet (1 to 2 meters) thick. "This perpetual contamination of Vesta with material native to elsewhere in the solar system is a dramatic example of an apparently common process that changes many solar system objects," said Tom McCord, the other lead author and a Dawn team member based at the Bear Fight Institute, Winthrop, Wash. "Earth likely got the ingredients for life - organics and water - this way."